Last Thursday, amid a sharp and unrelenting economic decline, the Zimbabwe main opposition party, the MDC Alliance, held a peaceful protest in Harare against President Emmerson Mnangagwa’s much-disputed leadership. 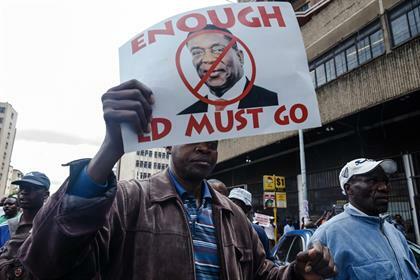 This demonstration came after Vice president Constantino Chiwenga had warned an increasingly belligerent MDC Alliance that, “no amount of demonstrations or barking will remove Mnangagwa”. It took an unprecedented coup, a dodgy election and a suspect Constitutional Court ruling for Chiwenga and Mnangagwa to secure power. Yet MDC Alliance leader Nelson Chamisa remains adamant that he is the duly elected president and only dialogue can help resolve what he terms as Mnangagwa’s ‘crisis of legitimacy’. But the hard-as-nails duo standing in his way of occupying the top office at Munhumutapa office building is unlikely to give up anything remotely substantial through talks of any type and this is the indelible political reality Chamisa must immediately grapple with. An ever-combative Chiwenga has publicly stated, “The presidency is not open to anyone who is not in Zanu-PF. We are here to stay”. And presidential spokesperson George Charamba has stressed that “there must be a recognition of ED as the winner of the 2018 elections” before talks can start. Chamisa has reportedly lodged a petition with the Southern Africa Development Community (SADC) and the African Union (AU) over the need for dialogue and consequent formation of a government of national unity to help solve an economic and political crisis. This petition claims the July 30 presidential poll results are “untraceable, unverifiable and unreliable”. However, the AU and SADC both endorsed the July 30 poll on August 1. AU chair President Paul Kagame of Rwanda and South President Cyril Ramaphosa both attended Mnangagwa’s August 26 inauguration. And Ramaphosa in fact recently called on the EU to lift sanctions imposed on Zimbabwe’s ruling elite and some state-owned companies. Could it not be any clearer for Chamisa to see that African leaders and African political organisations consider Mnangagwa as Zimbabwe’s rightful president? Could a plea from Chamisa compel the AU to defy a Constitutional Court ruling on Mnangagwa’s leadership at this rather advanced stage of an illiberal struggle for power? Chamisa has failed to articulate a definite plan of action to rally millions of people behind his electoral cause. The youthful leader has not set any credible benchmarks or drawn any red lines for Mnangagwa not to cross. He hasn’t articulated any possible consequences should Mnangagwa go about fulfilling his dubious constitutional mandate without a care in the world for the MDC Alliance’s public proclamations and massive marches. Despite declaring that the MDC Alliance was “planning something big” and promising to “take back our electoral victory” as far back as October 27, Chamisa’s public pledge to torpedo Mnangagwa’s disputed presidency has morphed into an uninspiring state of incessant namby-pamby political posturing backed by a fusillade of futile political bravado on Twitter. No tangible mass resistance to Mnangagwa’s questionable electoral victory has surfaced since an August 24 Constitutional Court ruling struck down an appeal lodged by Chamisa. So what is Chamisa’s long-term political game plan? Is he intent on removing Mnangagwa before 2023 through peaceful Arab Spring-styled demonstrations? What if that strategy fails and backfires spectacularly? Is Chamisa ready to face prosecution and possibly serve prison time for his extrajudicial claims to Mnangagwa’s presidency? MDC Alliance must revise strategy? The world’s moved on, unfortunately. Everyone – including China, the US and the EU – recognises Mnangagwa’s legitimacy. This ghastly, stubbornly hard truth must move Chamisa to stop flogging a dead horse and instead deliberate on a fresh political strategy. The MDC Alliance must make hard and intelligent decisions about how it can help improve the escalating economic crisis and best prepare for the 2023 elections (from outside of government). The ruling Zanu-PF party won the Mutoko North parliamentary by-election held on November 24 by a massive margin (11 141 votes to 1 329). This landslide victory is fully suggestive of how suspiciously ‘popular’ Zanu-PF remains in a majority of populous rural constituencies. This huge win is fully demonstrative of the structural advantages regularly abused by Zanu-PF to rig elections in rural areas; and this is right where all hope for achieving a Chamisa presidency in 2023 must find fresh life. Expending copious amounts of humanitarian goodwill from the masses on interrogating Mnangagwa’s obviously dubious but confirmed legitimacy is an utter waste of political capital as this won’t yield a solid result where it matters most: the rural areas. The “president” is considered to be illegitimate by the EU,USA and the COMONWEALTH; That is why there is not investment by overseas companies. The Chinese of course are waiting to cash in. Chamisa knows the “feeling” of the people. Disgruntled police, army, civil servants, the unemployed and doctors could stage a coup. Soldiers turning against politicians is bad enough, soldiers turning on soldiers is a disaster!